Tomatillo looks like any horse. To those in the know, the 18-month-old looks like one horse. At the Olympic Games of the future, will a horse compete against itself for gold? Tomatillo's owners are Finn and Mary Guinness, who also own Tamarillo. The Guinnesses watched British eventer William Fox-Pitt ride the latter to glory at the Olympics, World Equestrian Games and a succession of other major events until Tamarillo's retirement in 2008. At that point, there arose a problem. Like many horses at the top of equestrian sport, Tamarillo is a gelding -- in other words, the horse has been castrated, in the belief that geldings are calmer, easier to handle and therefore more readily prepared for the rigors of competition. But the decision to castrate the horse is taken well before it's apparent that the horse carries world-class genes. "When you've finally got your champion, it's too late, because it's a gelding," in the words of Finn Guinness, who brings a learned background to ownership of Tomatillo. Guinness was a one-time student of cloning at Edinburgh University and holds a doctorate in genetics. His wife, Mary, adds: "When Tamarillo turned out to be this treasure, my husband was regretting it like anything, because he was just interested in keeping the genetics going with the animal. The Guinnesses have cloned Tamarillo not to replace the horse in the arena, but in the bedroom. Without a clone, Tamarillo's world-beating genetics would be lost when the horse died. Now, Tomatillo can do the breeding in Tamarillo's place. "They have the same head, the same personality, the same coloring. It's completely uncanny when you deal with them all the time," says Mary. "It's especially in the eyes, for me. Looking at the eye, the eye is so similar. They are similar in the way they move, too, and my husband is obsessed with the swirls on his head. "We are going to try to breed from him, not this year but next year, to see what sort of animals he produces before we go on the open market." This is in keeping with a broader trend in equine cloning: the focus is on breeding, not sport. In mid-February this year, two clones of Irish stallion Cruising were revealed. Cruising died last year at the age of 29. Now, the existence of two clones (Cruising Encore and Cruising Arish) allows his phenomenally successful genes to continue, or so the breeder in question -- Mary McCann -- hopes. "Cruising would be the number one Irish sporthorse stallion in terms of producing both showjumpers and eventing horses," says Dr Tom Reed, a fellow breeder based in Ireland at Morningside Stud. Dr Reed says the Irish Sport Horse stud book -- or registry of horses, used by breeders -- "would be very interested in encouraging the owners to clone the horse." The stud book has struggled to find horses of Cruising's genetic caliber, he believes, and cloning represents a roll of the dice to preserve its greatest equine asset. Dr Reed sees that as a bad thing. "They're basically counting on 26-year-old genetics to bring the showjumping side of the stud book back into relevance and that's not going to happen," he argues. Yet for Eric Palmer, that is the joy and purpose of his work. "The job I'd done before involved technologies for reproduction, like artificial insemination. All the time, the reason for these technologies was giving people a tool to increase their genetic progress," Palmer tells CNN. "When I saw that cloning was possible, I realized it could be used to make fertile animals out of infertile ones. For me, this is the ability to make a gelding become a stallion." In 2005, Palmer worked with Dr Katrin Hinrichs, at Texas A&M University, on the cloning of Quidam de Revel. A decade later, Hinrichs still finds it hard to comprehend why anyone would clone a horse for sport, rather than breeding. "As a scientist and as a horse owner myself, it never occurred to me that people would want to clone horses to compete them. That's totally sideways," says Dr Hinrichs. "The reason these horses compete is to show they are really good at what they do, so you can choose the animals to breed to and improve the breed. It's because we want to know which horses are good, so we can choose the stallions and mares we want to breed, so the next generation is better. "If you compete a clone, what good is that? If the original animal showed great talent, then of course the clone will -- it can't really improve the breed." And yet some of the advantages are obvious. If you own a champion horse and want to carry on winning medals in future, a clone prolongs your access to that horse's winning genetics for a decade or two. The cost of cloning, at a shade above $150,000, is a fraction of the seven-figure sums routinely spent on champion jumping or dressage horses. Despite that, Palmer says clients at Cryozootech don't typically have their hearts set on sporting achievement from cloning. If they do, his advice is: cloning is not a sure thing. "Of the few cloned horses starting to compete, Levisto Alpha Z [the clone of Levisto Z], was a champion at four years old in Belgium, showing that clones can do sport," says Palmer. "So it may happen, but it's not really a good reason to make a clone. "When you clone a big champion, remember he had everything going for him: the best genes but all the rest, too. He formed a good combination with the rider. "Genetics is only 30%, 70% is other factors. So there's little chance that you will get all 100% of the factors being optimum. "I would say it's a bet. It's a bet where you have control over 30% of your chances, but you still have 70% that you have not yet controlled." Not only that, the science does not yet deliver a perfect replica -- as might be implied by the word "clone." 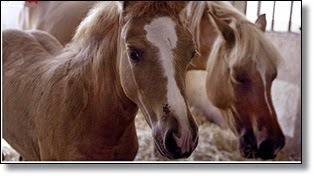 The process produces a foal that is almost, but not 100%, identical to the original horse. Moreover, Dr Hinrichs says it's only successful around a third of the time. "Cloning is such a science-fiction thing -- the idea that you can duplicate somebody," she says. "But this doesn't work the way it does in science fiction. The best simile is that it's an identical twin, born years and years later. It's going to have many of the same genetics but it's going to be very different, too." In 2012, the FEI -- equestrian sport's world governing body -- changed its rules to allow clones to compete, arguing that the move would encourage the preservation of the genes of leading geldings. That was the moment that concerns first surfaced in the wider media about the presence of clones in events. In reality, though, it appears more likely that the offspring of clones will be future Olympic champions, rather than the clones themselves. Returning to the theory that stallions are harder to train for sport than geldings, it's a given that for your clone to breed, they cannot be castrated. However, there is nothing to stop you turning the clone's offspring into geldings. Like today's stallions, clones are set to be used to sire hundreds of foals -- raking in money for their owners and spreading the clone's genes far and wide. Why castrate your clone and their expensive, world-beating genetics for sporting purposes when, a few years down the line, you can take your pick between dozens of the clone's foals? "We are sure that offspring of clones will be there in competition," says Palmer. Dr Reed worries about the concept. "I have a couple of fundamental problems," he says. "I have questions about the possible long-term effects. We don't know whether there will be negative outcomes associated with these clones that, once introduced into a population, could be detrimental to that population. "Another problem I have is that we're horse breeders, not horse manufacturers. What we basically have here is some very wealthy people getting hold of some genetic material and trying to gain some competitive advantages in breeding, and potentially in the arena, through cloning. "And once you let cloned genetics into your population, how do you get rid of it?" Dr Reed agrees is probably a matter of time until clones, or their offspring, show up in the sporting arena. "I'm not aware of any of them in sport [but] the door's been opened and there is no turning back, at this point, in terms of international sport," he says. It's unlikely that Tomatillo will be among them. But it isn't out of the question. "Who knows? it's very interesting to watch Tomatillo trotting, he does seem pretty similar to Tamarillo," says Finn Guinness. "I don't think we're going to be able to resist taking him a little way [in eventing], anyway. My main interest is getting his foals. We'll see. We're some way off all that." Mary Guinness says Fox-Pitt, the rider of Tamarillo, is preparing to have his second look at Tomatillo -- just in case there is something there. If anyone gets to ride Tomatillo in competition, she adds, it will be him. "People are so nervous about cloning," she continues. "I remember 35, 36 years ago when they had the first IVF baby and everybody thought it was a freak of science. Now it's the norm. I tend to think that cloning will be a fairly common thing in 30 years' time -- we're just ahead of the game, as it were. "Tomatillo looks absolutely like any other horse you would see in the field. He doesn't have five toes coming out of a hoof or anything like that. He's just normal. That's what people can't get their heads around." Dr Hinrichs, in pondering the prospect of clones in sport, comes up with a suggestion many people are unlikely to get their heads around. "I was just in a meeting," she recalls, "where somebody argued that if you want to test the ability of a person to train a horse and ride it to the top of the field, the ultimate challenge would be to have everybody riding the same clone. "Everybody receives a clone of the horse 10 years ago, trains it up and competes it at the Olympics. Then the variable would be the training, the upbringing, the handling and the riding. "Is the Olympics a test of the training and riding ability, or of the horse? It's probably the former. The Olympics is all about people, right?"